The Goliath bird eating tarantula is one of the biggest tarantulas in the world. It might grow to have a leg span of 10 to 12 inches (25-30 cm). They have a brown, coffee-colored body and long legs. Because they are very aggressive, they should be kept as pets only by experienced owners and be handled very carefully. 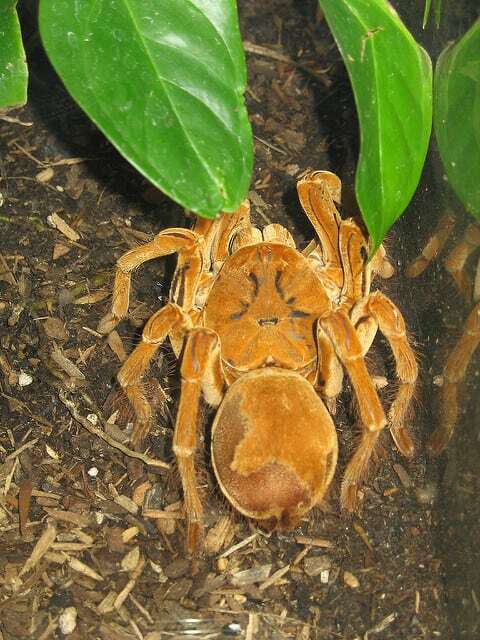 The Goliath Bird Eating Tarantula could be found South America in places such: Suriname, Guyana, parts of Brazil and Venezuela. The Bird Eater is found in the rain forests of Amazon. It usually lives near swamps and marshes. It’s a terrestrial animal that digs burrows and lives in them. Also, like a lot of other tarantulas is a nocturnal one, meaning that it mainly operates by night, while hiding by day. Contrary to its name, the Goliath Bird Eating Tarantula doesn’t really eat birds. The name comes from an illustration made by a German naturalist on which the tarantula eats a hummingbird. Their usual diet is consisted of frogs, beetles and all kinds of insects, small snakes, lizards, mice or even bats. Most of the Goliath Bird Eating Tarantulas need approximately 10 years to mature. Most of the male Goliath Tarantulas live up to one year after mating, and females can live as much as 25 years. Interesting fact is that the Goliath Bird Eating Tarantula can re-grow missing limbs if needed. The Goliath Bird Eating Tarantula needs a 30 gallon tank and a closed top as a security. Also, make sure that it has ventilation. The bottom should have a minimum of 6 inches soil substrate, deep enough for the Goliath to bury itself. On top of the substrate you could put mulch or peat moss, but make sure to leave enough space for the Goliath Bird-eater to make its burrow. Also, some kind of flowers, plants, rocks or logs could be used as decorations. No additional lightning is needed because the Goliath Bird-eater prefers dark. Don’t forget to mist the terrarium with purified water on a weekly basis and also provide a heating pad under the tank. 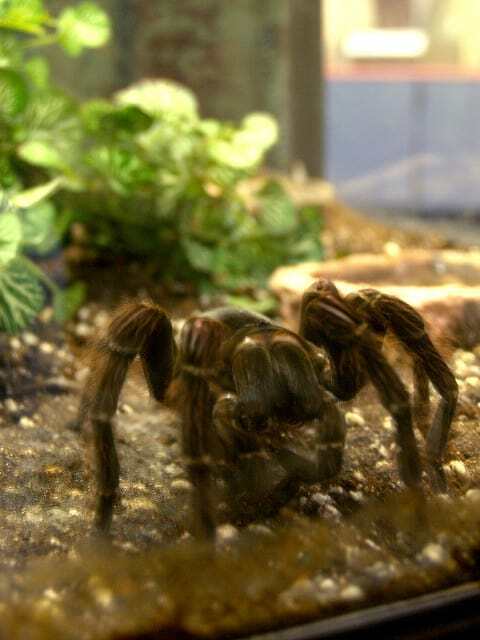 Theraphosa blondi – Latin name. Goliath Bird-eater. You should provide a heating pad under the tank and ensure a constant temperature of 78 to 82 Fahrenheit (25-27C). The humidity needs to be around 80 percent. Having a thermometer and hydrometer is a must in order to keep a good environment for your Goliath Bird Eater tarantula. 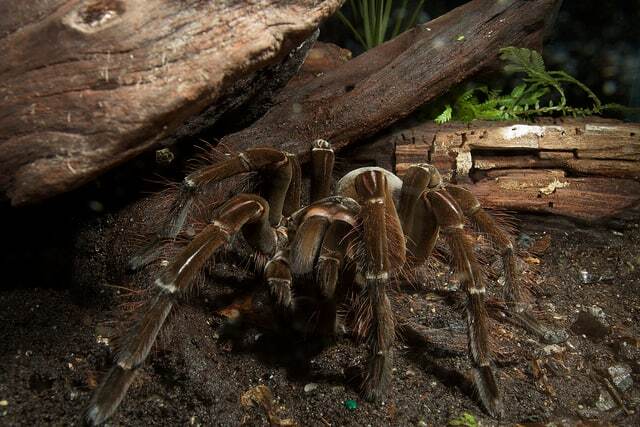 One of the most aggressive tarantulas and are rarely kept as pets (only by experienced owners). They tend to show signs of aggressiveness by making hissing noises by rubbing bristles. The venom of a Goliath isn’t deadly for humans, but it might cause severe pain, sweating and nausea. Also, when threaten, the tarantula might flick off hair from its stomach which paralyzes smaller animals. For humans, it might cause irritation on the skin or lungs. Unlike most of the tarantula species, the male Goliath has a 50-50 percent of getting eaten after mating. The mating process starts with the male attracting the female in front of her burrow. Restraining her fangs while mating. Afterwards he has to get away fast in order to stay alive. The female layes approximately 50 eggs in a sac and takes care for them for 6 to 7 weeks (even gets them with her when looking for food).